1. Cook the pasta in a large pan of boiling water according to the packet instructions. 2. Meanwhile, heat the oil in a large frying pan and cook the bacon, courgette and garlic for 5 minutes until the courgette is golden and the bacon lightly crisp. 3. Beat together the eggs, cream and cheese. 4. Drain the pasta loosely so there’s still a little water clinging then return it to the pan off the heat. Add the bacon and courgette, and the egg mixture and toss well together so the heat from the pasta lightly thickens the sauce. Divide between 2 bowls, grind over some black pepper and serve. 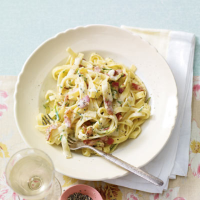 This carbonara-style sauce is well-suited to any pasta strand — try it with spaghetti or linguine, too. This recipe was first published in Wed Mar 05 10:51:25 GMT 2014.